Please click on any of the headlines here to learn more about the impact we are having on our kids and on the community! 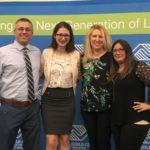 Sanja Kirova had tears in her eyes when Boys & Girls Clubs of Greater Northwest Indiana named her its Youth of the Year on Thursday, March 14 at Marquette Park Pavilion. Kirova, 18, a member of the Portage club, was one of eight members nominated for the honor. She will go on to the state competition and potentially to regional and national competitions.